A miracle of fire unquenched by sea. The sea — 71% of this earth God entrusts to us is sea, so how could we possibly remain unaffected by its might, its ever-changing moods, its broad palette of colors, its spectrum of aromas and sounds—its indefinable mystery? Always I have loved it. Many people fear entrusting their lives to the open sea (out of sight of land), but for me, being released from the importunate demands of land-based civilization frees me to soar. If a storm should conclude my life there—well, what a way to go! Over a third of our two weeks was spent at sea. And let’s face it: only at sea do you really get to know a ship. When you look up and up and up from a gangplank, all you can see is a species of skyscraper. But once the ship sails out of port and land slips away, the ship becomes a living person with its own unique personality and idiosyncracies, just as is true with flesh and blood human beings. Invariably, whenever one sails out of a harbor, we are exhausted by the trauma of completing all the thousand and one things that had to be done before we left home, packing (and hoping one didn’t forget anything), getting to the airport in time, making it through security and the check-in process, finding a seat, traveling in another airborn cattle car (with little elbow or knee room and nothing to eat but snacks), disembarking and getting to a lodge or hotel, making it to the dockyards, going through the endurance contest of security, checking in, finding your stateroom, and worrying that your luggage will fail to catch up with you; then unpacking your suitcase, and finding places for all that was in them, sailing out of the harbor, lifeboat drill, return to your stateroom—and crash! You sleep—if you are not too exhausted to do. Lucky are you if sea days separate you from your first port of call. In our case, we were blessed with 60 hours at sea before we’d see land again. During those hours, regeneration flowed in upon us, as soothing as the eternal sounds of the waves breaking against the ship. Slept in until 8:00 a.m. Connie, who’d not slept as well as I had, was reluctant to uncoccoon herself. 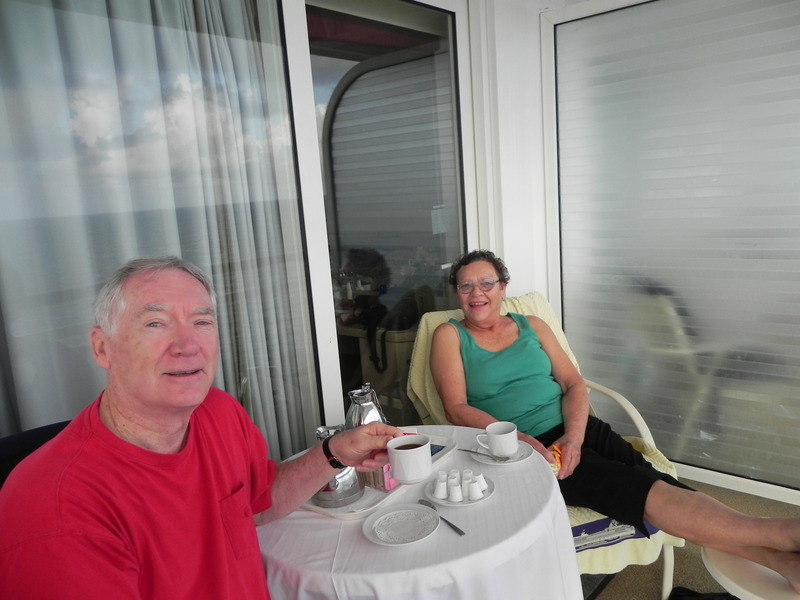 We had a delicious breakfast in the San Marco Restaurant, all the while reveling in the sight of the sea outside the great windows. Afterwards I found my way to the Excursion Desk and pumped a daytrip counselor about the pros and cons of the day-trips our group was considering taking. It took some time before I’d decided which ones to take and booked them. Later I shared my findings with the other five of our six-pack. Later, I climbed up to the top deck so I could get my daily quota of exercise in. For a number of years now, I have religiously maintained a daily exercise regime; never missing even one day (reason being I know myself too well to ever again miss so much as one day, for the pattern would then be broken, making it all too easy to miss the next, and the next). This far north, it was still relatively cool, so making loop after loop on the jogging track was relatively easy. But the further south we’d go, the higher heat and humidity would force all of us to exercise either in the early morning or late evening. And if any of us failed to exercise, given the omnipresent food on the ship, we’d be blimps by the time we disembarked at Fort Lauderdale. Then I napped. Afterwards, we gussied up for our first formal dinner. A little over two hours later, we filed into the Celebrity Theater to take in a Hollywood variety show. Fast-paced, well choreographed and performed, and relatively free of blue material. Sadly, not true of some of the subsequent evening programs. One thing I must compliment Celebrity on. Now that cruise lines lure passengers on by heavily discounting the staterooms, management is forced to make it up in other ways—especially by pressuring passengers to purchase liquor. We’ve been on some ships where you could hardly walk ten steps without being accosted by a liquor purveyor. That was not true on the Constellation. Back in the room, I caught up on my journaling, crawled in, then blissfully listened to the waves until those sounds segued with my dreams. We finished in time to make it downstairs for the real breakfast: a monstrous buffet! With every kind of breakfast deliciosity imaginable. Live easy-listening music was performed as we ate. When we finally hoisted our bulk out of our chairs, we could hardly move. 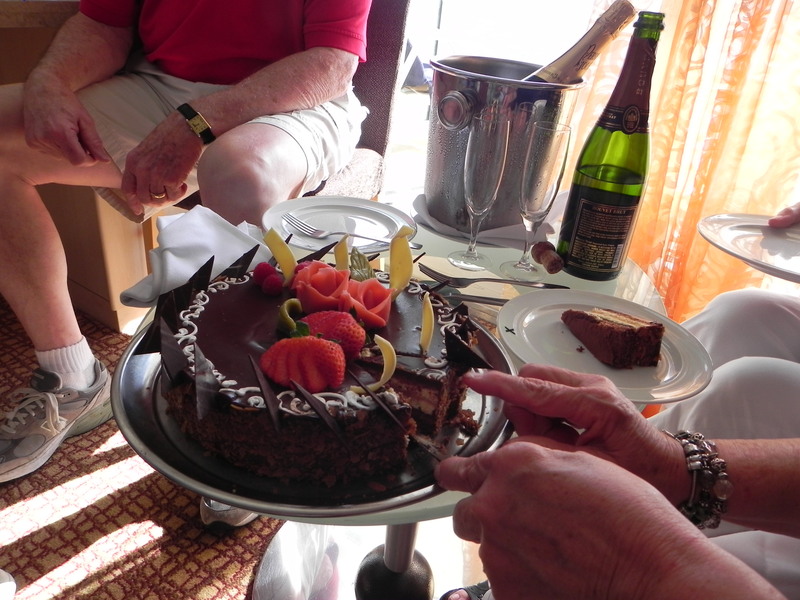 By 3 p.m., we were “hungry” enough to knock on the Earp’s stateroom door, there to join the Riffels for a surprise birthday party for Lucy. Actually, that’s what started the whole thing: Almost a year before, Bob had asked us if we’d like to join them for a special birthday celebration . . . on the Constellation. Obviously, it turned out to be the most expensive birthday party we’ve ever attended! 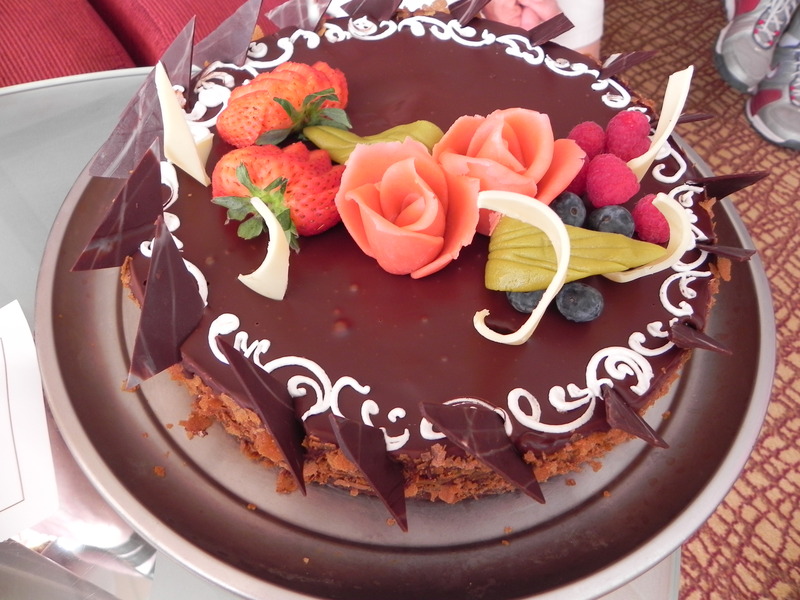 Tondi knocked, and entered with a big cake and beverages on a silver tray, we sang Happy Birthday to Lucy, and we snarfed down enough cake to stave off starvation for a few more hours. That was followed by a no-holds-barred game of Phase Ten, that lasted until dinner time. After which it took me fifteen loops on the top deck to work off some of the day’s caloric intake! Next Wednesday’s blog will continue the saga of our sea days. Bonaire essentially has the same history as the other two islands. It is small, with only 14,000 people living here. It is not surrounded by a reef—it is a reef, perched on top of an undersea mountain. Its capital city is Kralendjck. I must confess, I was less than happy the ship was stopping at this sparsely inhabited and little-known island. But when I saw how many passengers disembarked with their scuba gear or ready to go birding, I began to understand why. Bonaire is still unspoiled by civilization, and its waters are pristine; in fact, it is rapidly becoming one of the diving hubs of the Caribbean. Over 15,000 pink flamingos call it home, as well as over 200 species of birds. It too has lovely beaches and lonely scenic roads. One travel guru in the know declared that ten years from now, at the current rate of growth, Bonaire will be the next Aruba. We explored the capital city—between downpours! We’d shop, walk around, flee for shelter when each downpour came, then repeat the cycle. 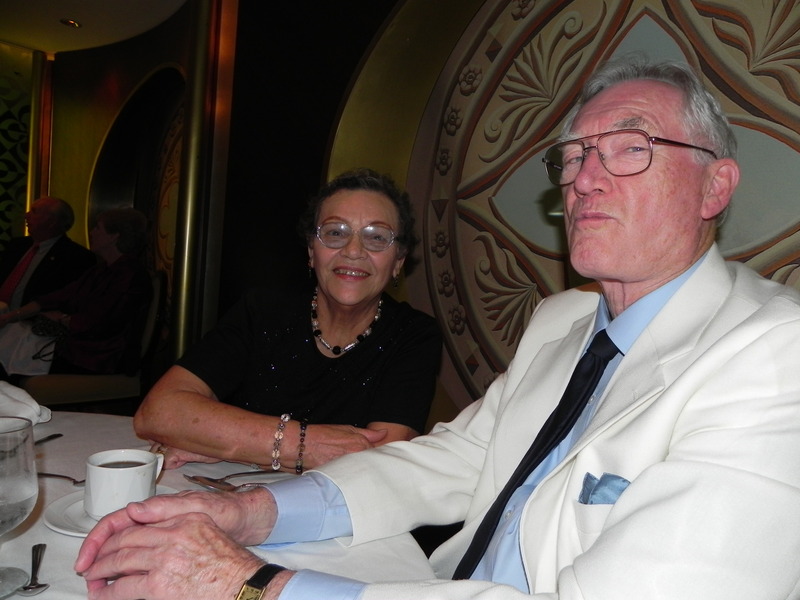 Finally, we returned to the ship, this time for good, as we were boarding early: a long way back to Fort Lauderdale. The gangplanks were pulled back in, the ropes were cast off and cranked in, smoke began to pour out of the smokestack, the great engines thundered into life, and the ship began to leave the dock. As usual, the top deck was thronged with hundreds watching another departure take place. But this was different from all others! Blocks away a young man was running at top speed, frantically waving his arms, and shouting. Closer and closer he came—but it was too late. 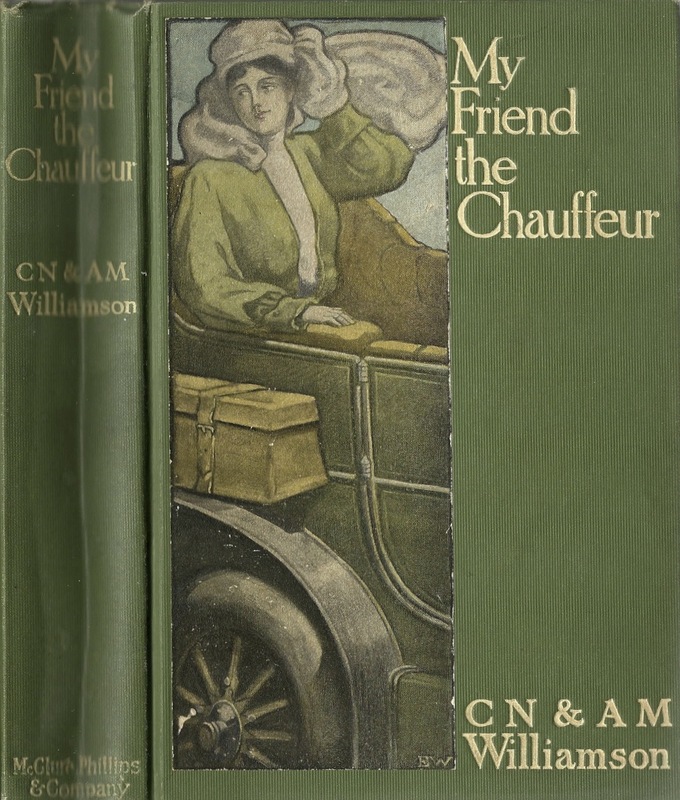 We could see him rush up to the boarding area, gesticulate wildly, and cover his face in despair. We discovered he was a crew member, probably in a romantic tryst, and forgot the time. We asked what would happen to him. We were told that he’d have to fly back to Florida at his own expense (they are paid oh so little! ), and if this was his first offense, most likely he’d be forgiven—for this time. But woe be unto him if he missed another! It sobered all of us. Perhaps because we applied being left behind to so many possible situations in our own lives. 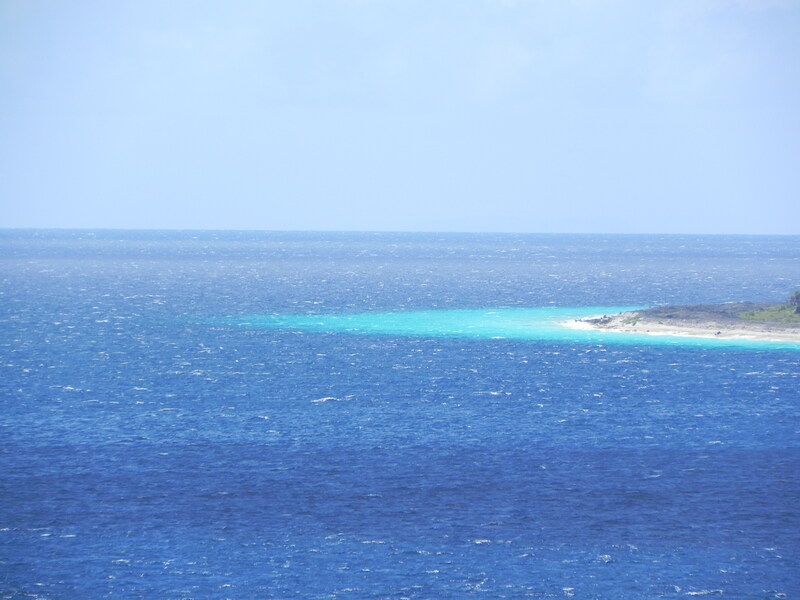 Finally, the dim outline of Bonaire disappeared—we were at sea. Next week – sea days . . . and home. This strategic island is the largest of the Netherlands Antilles, with 383 square miles of land mass, and a population of over 140,000. It was one of the first Caribbean islands to be inhabited: The Amerindian Arawaks came across from South America about 4,500 years ago. Alonso de Ojeda came here in 1499 and claimed it for Spain. Interesting story about the island’s name: many of Ojeda’s men came ashore gravely ill of scurvy, that bane of sailors in those pre-refrigeration days. Once on the island, citrus fruit cured the scurvy; in gratitude, the Spaniards dubbed the island “Corazon” (heart), hence Curacao. 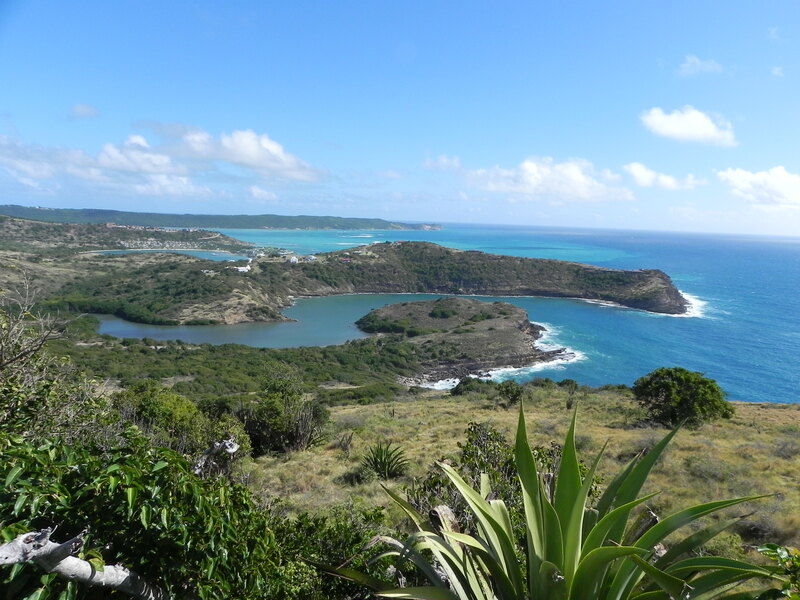 The Dutch invaded the island in 1634, and have held it almost continuously since then. 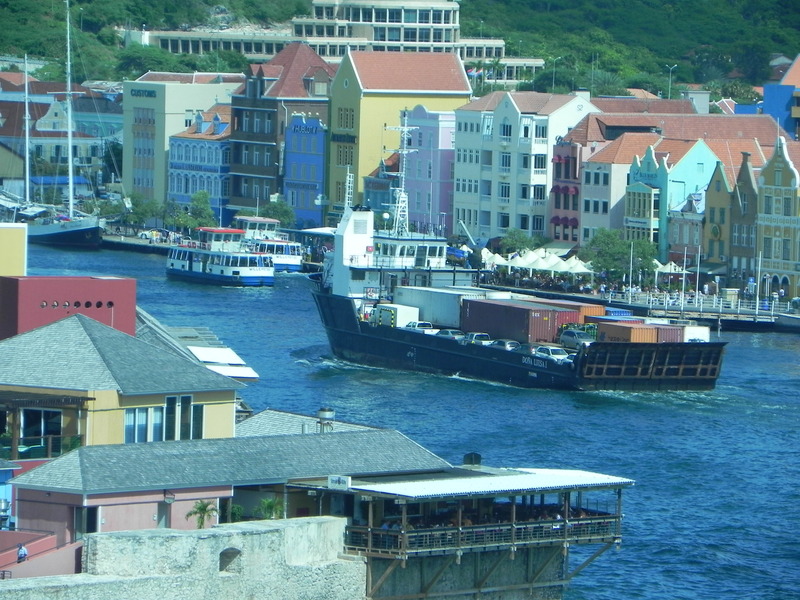 Willemstad, with its natural deep harbor, made it a natural as a slave depot. During centuries of slavery, close to half of all slaves being ferried across the Atlantic from Africa, stopped here. Great forts such as Fort Amsterdam, Fort Riffort, Fort Nassau, Fort Beekenburg, and Fort Wankzaamheid made the island close to impregnable. During World War II the Allies used the island as a military base. Shell Oil came here in 1915 to begin the oil era. Other than the slave period, which came to an end in 1863 when King William III abolished slavery in all Dutch possessions. Curacao has always been known for its tolerance of all, religions as well as races. In fact, the oldest Jewish synagogue in the Western Hemisphere, the Mikvé Israel-Emanuel Synagogue was constructed here in 1651. Over fifty different nationalities peacefully coexist here. Today, the port is one of the largest and most active ports in the world. 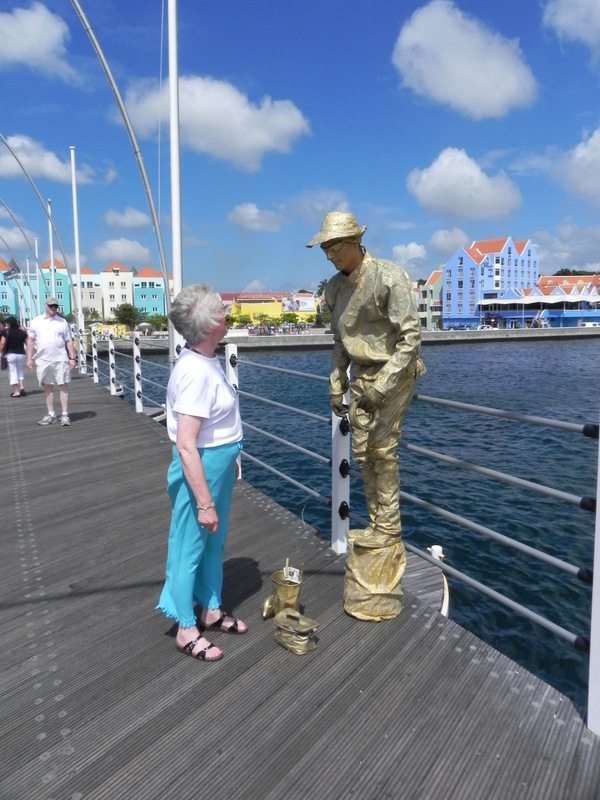 Here too, Connie and I had spent considerable time during our 25th anniversary trip, so we just savored Willemstad. It was a stunningly beautiful day, the temperature balmy. It is a great shopping city. But what impressed us both—and the Earps and Riffels as well—was the cleanliness of the city and the harbor. We can thank an early island governor for the visual tour de force tourists experience here. 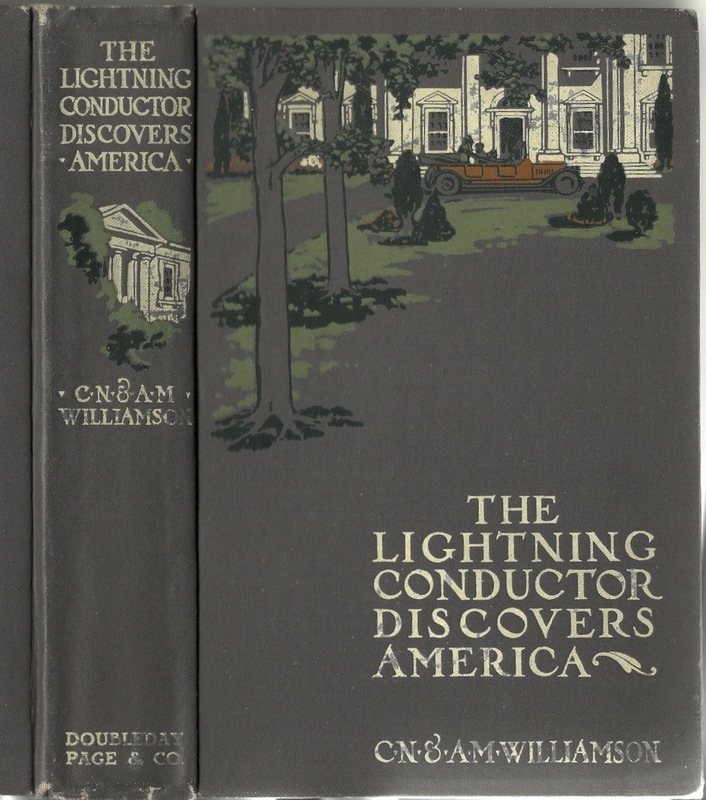 He complained loudly that the blindingly white buildings gave him excruciating headaches; as a result, the buildings were painted in lovely pastel shades. The main action appears to center on the famous Queen Emma Swinging Bridge. Whenever a ship or yacht comes through—which is often!—the people are stopped at both ends, and the long bridge slowly begins to swing open. While this is happening, passengers can cram into free ferries and cross that way. 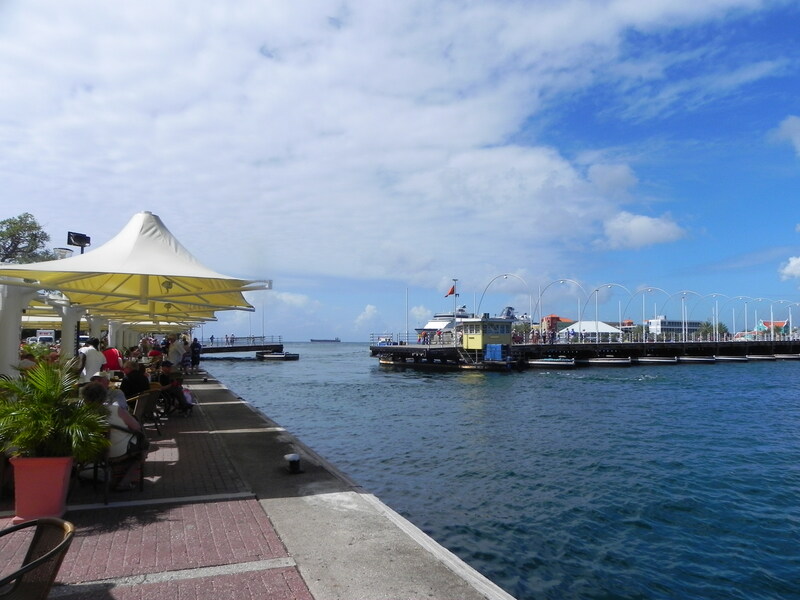 As Bob and I sat sipping Cokes at a wharfside café, we watched the people throng by—people from all over the world—the Queen Emma’s bridge with mimes bringing traffic to a halt in the middle of it (when its gates open again, of course). That evening, we watched Obama’s “State of the Union” message on our stateroom TV. How interconnected our world is today! Rarely have I ever been more reluctant to leave a harbor city than I was when, toward sunset, the Constellation sailed out to sea. 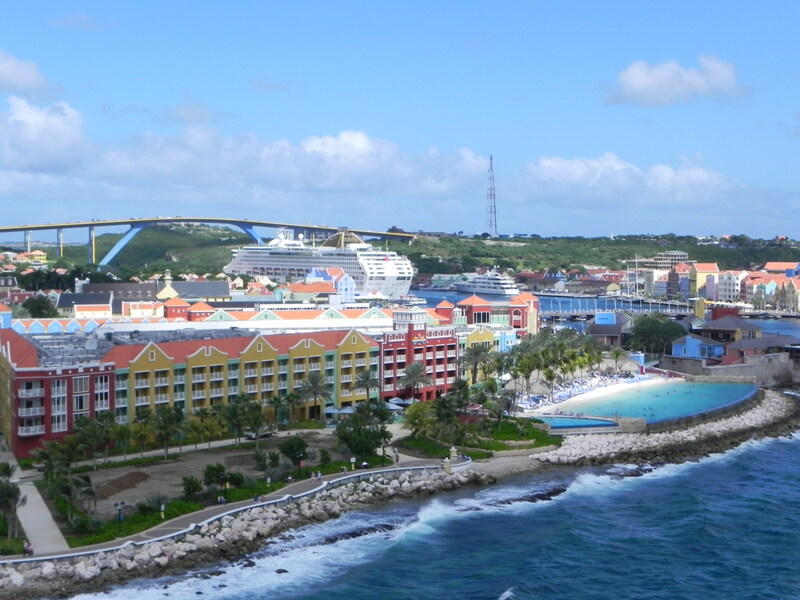 Our last three ports of call were Aruba, Curacao, and Bonaire, the so-called ABC Islands, part of the Leeward Island group. 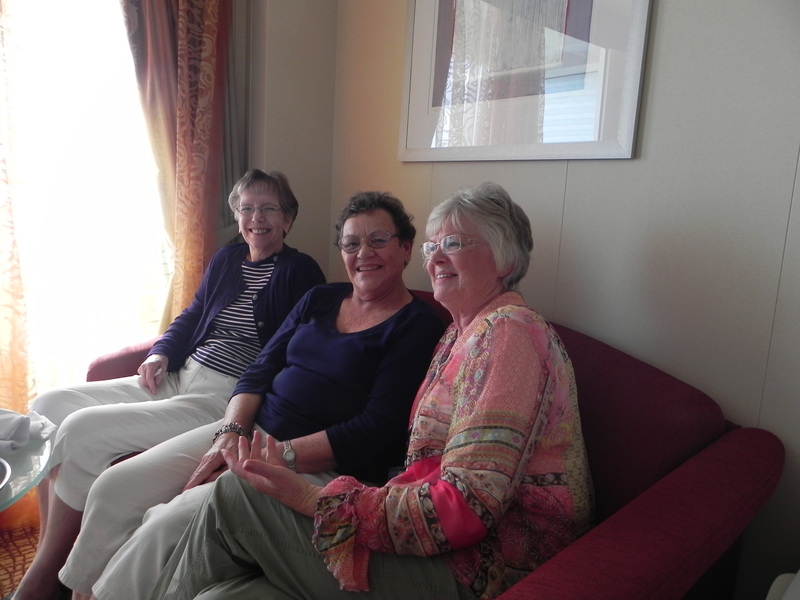 Our ship docked at each island for a day, so we had time to savor the Dutch experience. Aruba is small (only 75 square miles), with a population of 75,000. As is true with all three islands, the languages spoken include Dutch, English, Spanish, Portugese, and Papiamento (a mixture of Dutch, Spanish, Portugese, and African dialects). Orenjestaad (meaning “Orange City”) is the capital. It was “discovered” by the Spanish conquistador, Alonzo de Ojeda, in 1499. The Arawaks, however, would beg to differ: they’ve been on this island for over 2,000 years. In 1636, the Dutch, hearing that Aruba was only lightly defended, invaded and took possession. They’ve been here almost continuously ever since. In 1824, gold was discovered on the north coast; the gold rush lasted until 1916. Aloe came next—and continues; today Aruba is the world’s largest producer of aloe. In 1929, oil replaced gold, as Standard Oil of New Jersey (today, Exxon) initiated an oil boom that continues to this day. In 1959, the first cruise ship arrived; more have come every year. Today, over a million tourists come here every year, consequently Aruba’s 6,000 plus hotel rooms are often full. Some of the loveliest beaches in the Caribbean can be found here. Politically, Aruba is a state within the Kingdom of the Netherlands. 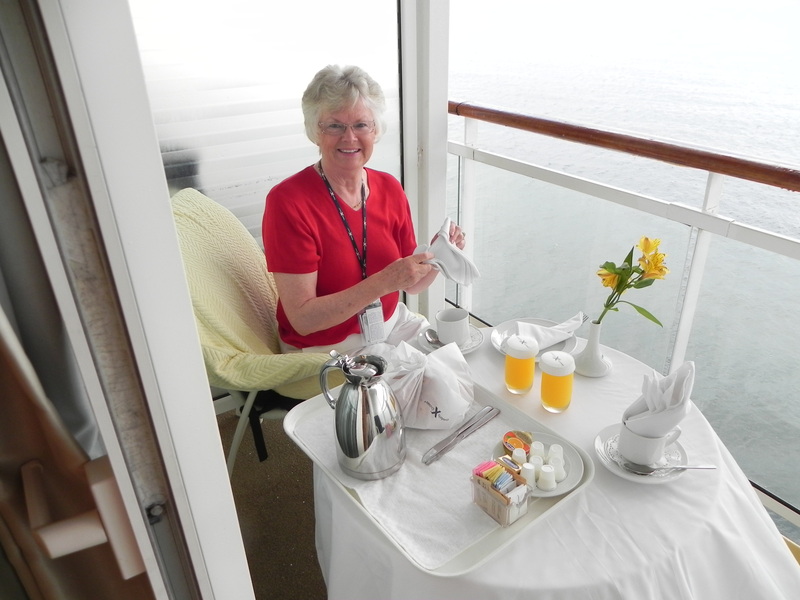 We awoke early, went out on the veranda to watch the harbor come into view. Overhead were the Southern Hemisphere’s almost ubiquitous frigate birds. Tankers, tankers at docks, tankers coming, tankers going—tankers as far as the eye could see! Filling the horizon beyond which lay Venezuela. Since our children, Greg and Michelle, sent us here as a 25th anniversary present back in the 1980’s, we’d already thoroughly explored the island, so this time we contented ourselves re-exploring Oranjestaad. Since it rained periodically, our gang seemed to always be seeking cover. Our group of 6 in Oranjestaad. Near the Equator, there is no twilight; one minute the sun flames across the sky, another, and it is pitch dark. Since it is cooler then, that’s when many of us do laps on the top deck. As an author, I’m always watching people, listening to them, creating mental pictures of those who stand out from the crowd. One young woman I can’t help but notice because she keeps passing me. I’d liken her to a slim goddess, long hair, fast-moving, light as thistledown, never speaks, never an opportunity in the gloom to get a good look at her—just enough to know she’s that rarity: understated beauty and radiant health. Ascended stairs like a puff of smoke, fluid movement rather than steps—grace personified. She reminded me so much of Lygia in my story, “Journey”; just more athletic than she. Some day this one too will show up in one of my stories. 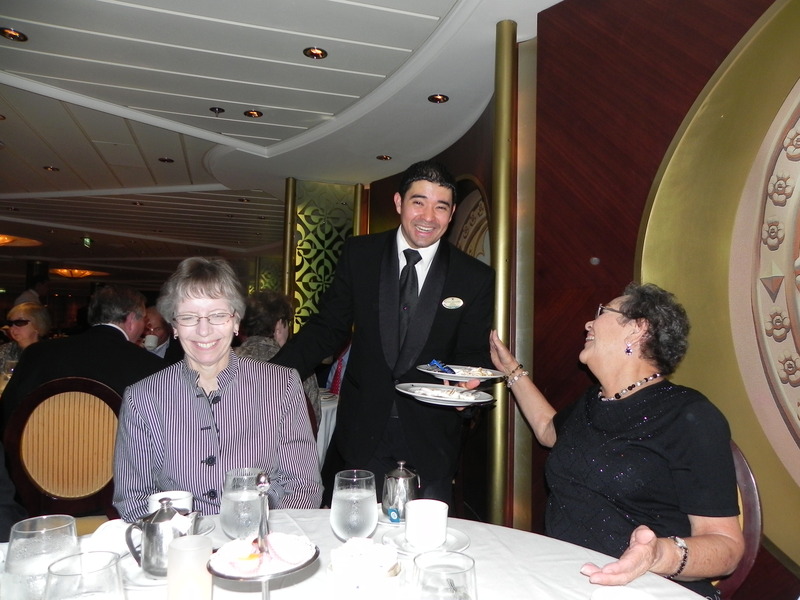 After the ship moved out to sea, we finished Phase Ten, then went down to eat. Afterwards we listened to an Argentinian singer for a while, before turning in. The nation of Grenada (the southernmost tip of the Windward Islands) is in size 120 square miles (21 by 12 miles), and consists of three islands: Grenada, Carriacou, and Petite Martinique; 90% of the approximately 100,000 population lives in Grenada. After bickering over the islands for over a century and a half, the British (no small thanks to the Treaty of Paris in 1783) finally took full possession. In 1877, it became a Crown Colony; in 1974 it became an independent nation. But its post-independence road has been anything but smooth. It entered the U.S. history books on October 25, 1983, when Reagan invaded it; in the process, 70 Cubans, 42 Americans, and 170 Grenadians died. Indeed it was the long arm of Fidel Castro that caused Washington to step in. Today this lovely mountainous island, graced by rainforests and waterfalls and 45 white sand beaches, attracts 400,000 visitors a year, 285,000 disembarking from cruise ships such as ours. Fully one-sixth of the island has been set aside in parks and wildlife sanctuaries. 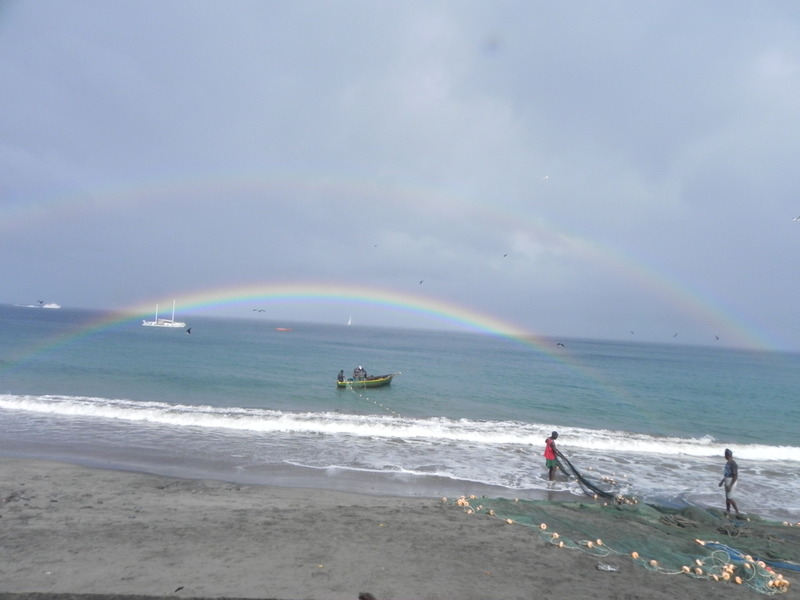 Shortly after we returned to our room, Grenada began to loom ever larger out of the mists. And later yet, we saw ahead of us the picturesque capital city of St. George, one of the loveliest port cities of the Caribbean. As we came into port, slowly nosing into position next to the just arrived Princess Cruise Line’s Emerald of the Sea, I was jolted by an epiphany: Only feet away, in matching cubby holes, were men and women, a number still in bathrobes. They were watching us as intently as we were watching them—out of these few seconds came this unsolicited epiphany: In each matching cubicle across from us are others just like us. Each, like us, with kindred dreams, yearnings, hopes, aspirations. Like us, they’ve come here hoping to learn, to grow, to make the most of whatever life is left to them. Each of them is perhaps wondering the same thoughts about us! As a result of those sudden insights, people I’d never even met before suddenly seemed like friends I’d like to know. 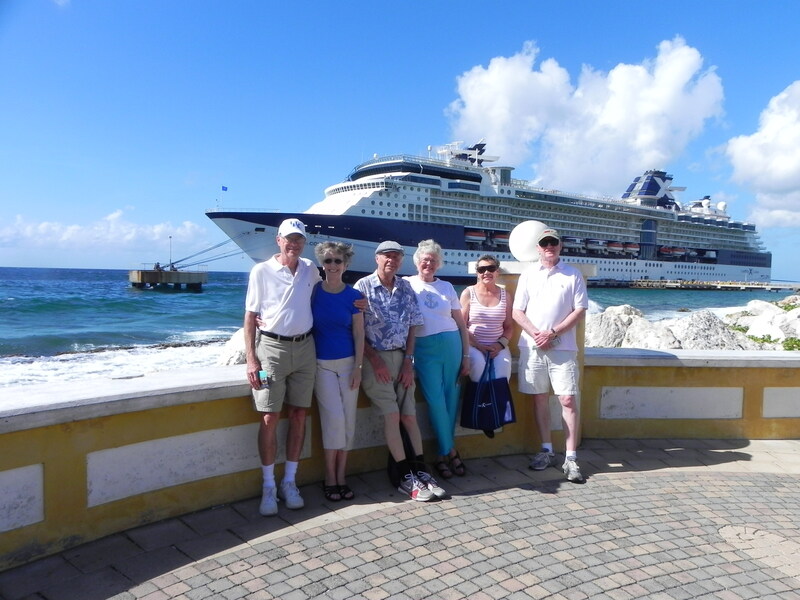 Then, at 8:12, a voice over the intercom: “Time to disembark!” Today, Bob and Ed were taking the Estange Rain Forest tour with me, and Lucy and Jo taking the Spice tour with Connie. 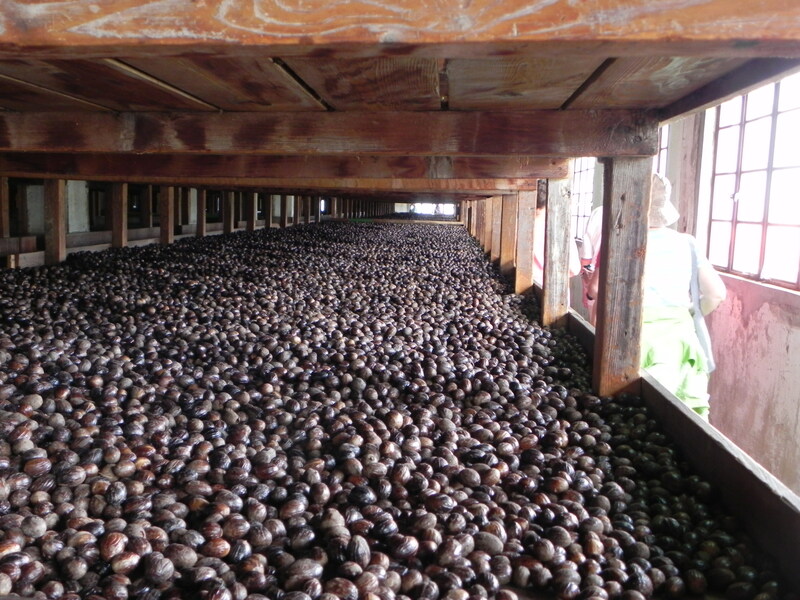 And speaking of spice, for good reason, Grenada is known around the world as “The Spice Island,” growing one-third of the world’s nutmeg and mace (second only to Indonesia); also growing cinnamon, ginger, cloves, and cacao (chocolate). A blind person would have known where we were by the fragrance: Daisann McLane was writing about just such a place as this. For the rest of our lives, the smell of nutmeg, mace, and cinnamon would transport us back to Grenada. Since it was raining, we raced for our bus (#100/600); our genial guide’s name was Roger. 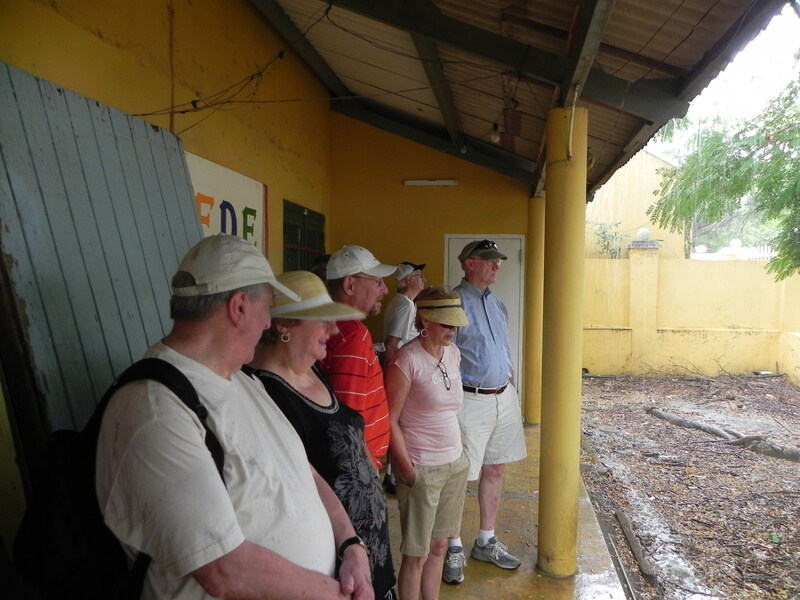 Grenada receives 60 inches of rain a year, but the rainforest where we were headed, much more—up to 200 inches! First we experienced city streets, followed by narrow scenic roads along the coast. Then up, up, up, into the mountainous rainforest. We stopped at a spice plantation. Fascinating! Roger educated us in spice lore (specifically spices, cacao, cinnamon, bay-leaf, nutmeg, etc). How cinnamon is merely a stick off a tree, with a strong fragrance. Cloves – always reminds me of unfond memories in dental offices. Pain too—especially during my growing-up years. Observing other groups led by noncommunicative guides, we felt blessed. 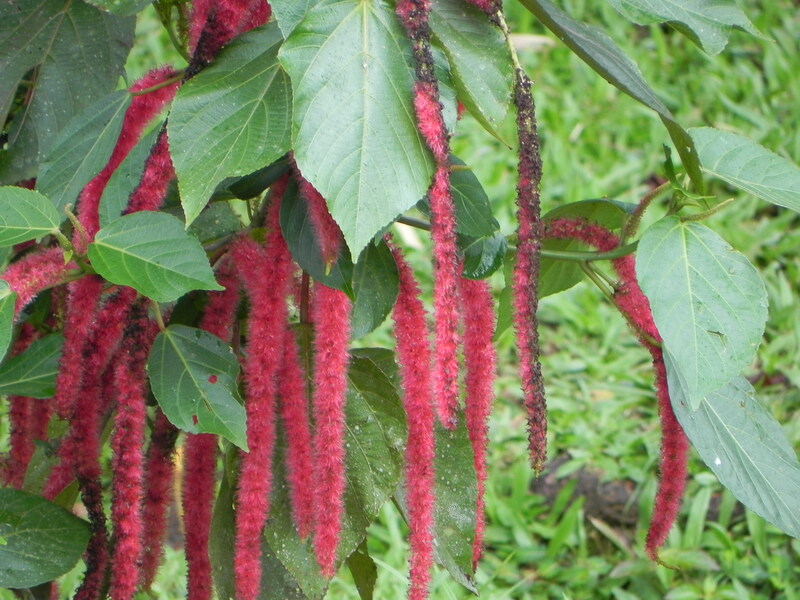 Farther on, Roger would stop periodically so we could see the kind of tree each spice grew on. We were now up to around two thousand feet; here and there we passed rivers, creeks, and waterfalls. Grenada certainly lives up to its beautiful namesake in Spain. Then that poignant moment, back on the Constellation, when we joined hundreds of other passengers on the top deck, then watched for the lines to be cast off, the smoke begin to rise from the smokestack, the waving at passengers in Emerald of the Seas (next to leave the harbor), the mournful blast of our horn echoing across the water, and then the slowly receding city—and finally the island itself. No matter how many times I experience such a leaving, it never fails to move me deeply. Especially when I wonder, Lord, how many more such leavings are left to me? Barbados, the easternmost island of the Caribbean, was first discovered by the Portugese explorer, Pedro a Campos en route to Brazil in 1536. He named it Los Barbados because of the island fig trees with their long hanging aerial roots. The island, however, remained uninhabited until 1625, when Captain John Powell landed here and claimed it for England. As was true in most other Caribbean islands, slaves were brought here from Africa to tend the sugar plantations, hence the predominant African population today. Dubbed “Little England,” it lives up to its name by being the most English of all the Caribbean islands. The islanders remained loyal subjects of the British crown for almost 350 years, then since declaring independence, have remained British because of their Commonwealth status. It is British in so many ways: (1) they drive on the left-hand side of the road; (2) their national sport (make that obsession) is cricket; (3) not far behind being polo and soccer; (4) they love, cultivate, and cherish traditional English gardens; (5) Saturday horse races are part of the culture; (6) most Barbadans are Anglicans; and (7) they still celebrate the monarchy. The island’s land mass is 166 square miles (21 by 14), and has a population of 285,000. Unlike most Caribbean islands, it is largely of coral formation rather than volcanic. Much of it is relatively flat; its highest point is 1161′ Mt. Hillaby. It is blessed with many lovely beaches: calm turquoise seas on the Caribbean side, wild Atlantic breakers on the east side. Since most of the forests were cut down in order to plant sugar cane, not much is left; even so, Barbadans have created a wildlife reserve to safeguard the species they have left (including over 8000 green vervet monkeys. 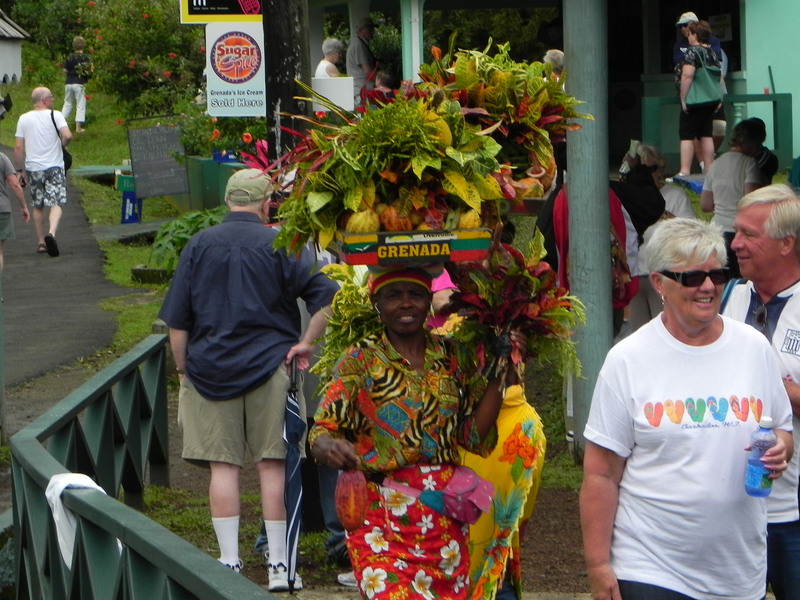 As was true with St. Lucia, Barbadans have created over the last four centuries a vibrant and rich culture. In sports, their cricket heroes are known around the world: especially the Three W’s: Clyde Walcott, Frank Worrell, and Everton Weeks (all three knighted by the Queen), and Garfield “Gary” Sobers, generally considered to be the greatest cricket player of all time. One of the Eastern Caribbean’s leading poets is Edward “Kamau” Brathwaite, and their foremost novelist is George Lamming. Through astute planning, and investing, Barbadans have made Grantley Adams Airport the main eastern Caribbean hub for flights from North America and Europe. 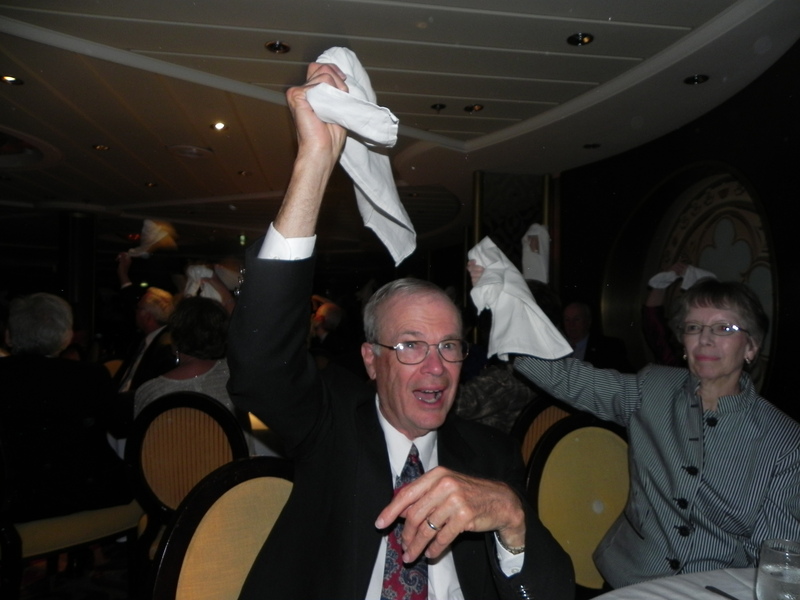 Cruise ships disgorge over 500,000 tourists a year. Here’s a trivia item for you: Did George Washington ever leave the North American continent? Yes, but only once. In 1751, then only 19, he accompanied his half brother Lawrence on a voyage to Barbados. Lawrence, suffering from tuberculosis, came here, and rented lodging, seeking a climate conducive to curing his ailment. George, on the other hand, during the six weeks the brothers spent here, contracted the dreaded disease smallpox, which left his face permanently scarred. As for Lawrence, he was dead within a year—as a result George inherited the Mt. Vernon estate. 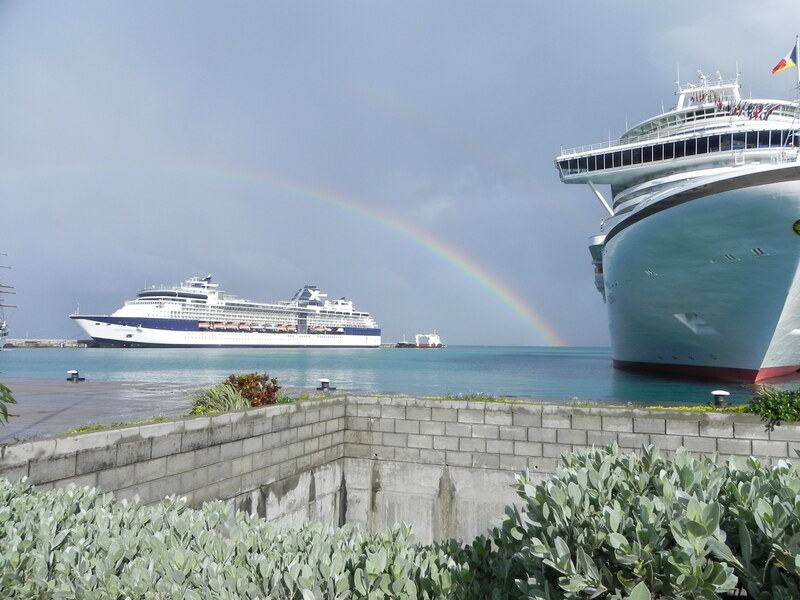 It was pouring rain when we disembarked from our ship in Bridgetown. Ed and I were drenched in our mad dash to get to the safety of our bus. Jason, our guide, was most informative. We learned that Trafalgar Square, erected in honor of the greatest naval hero of the age, Lord Admiral Horatio Nelson, had sailed out of Barbados in 1805, only months before dying in the great battle of Trafalgar, which ended Napoleon’s hopes of dominating the seas. 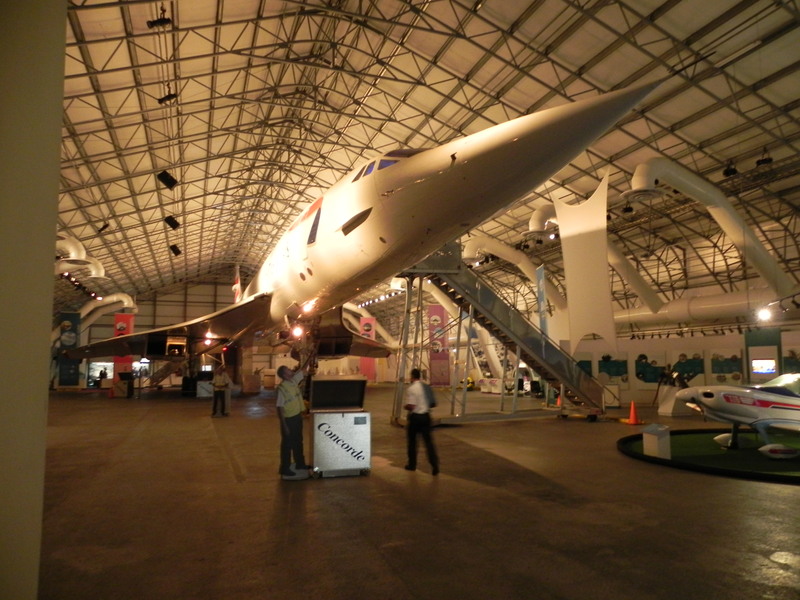 We also learned that Barbados was one of only four permanent airport destinations for the near mythical supersonic passenger jets, the Concordes. Not only that, but one of the few intact Concordes ended up here in a large building constructed around it. Of course I had known of the Concorde’s flying at twice the speed of sound, but never could imagine coming up with the price of a ticket to fly in one. Only princes, potentates, and wealthy people had that kind of money. When we walked into the building, I was overwhelmed by the reality of its size and configuration. It looked otherworldly and forbidding. In a sound and light show we learned that it was supposed to usher in a new age of ever faster flight: getting to places before you left them (time-wise, that is). But few airports could handle them and their thirst for gasoline was the stuff of legend. And they could only accommodate 80 people a flight. After the show we were permitted to ascend the steep flight of stairs into the plane. Never in my life had I seen a plane standing so high off the ground. At rest, the long nose dropped like a mosquito’s proboscis; in flight, it straightened out. 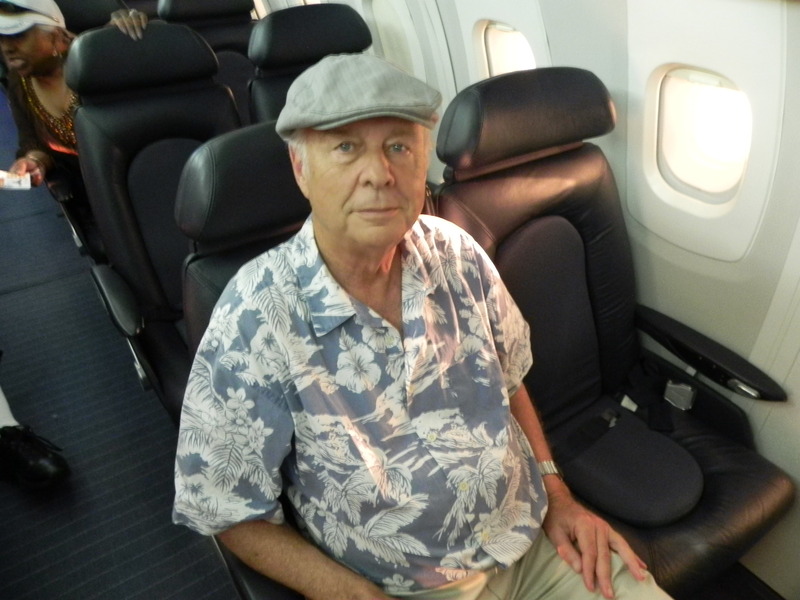 Inside, it felt like we were in a rocket instead of a plane—very little headroom, and dark. Thanks to the sound and light effects, we really felt like we were flying in it. 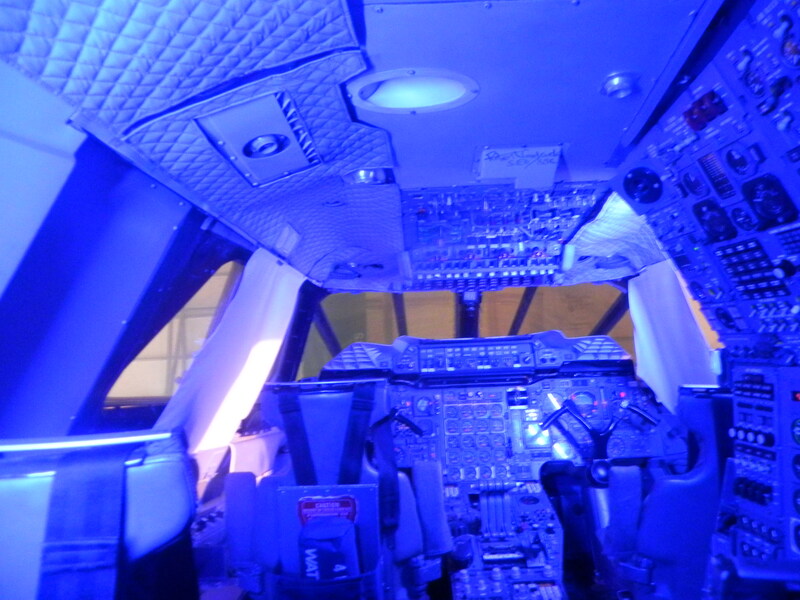 The blue-lighted cockpit seemed the stuff of sci-fi or dreams. They even gave us a facsimile ticket just as though we’d paid full price. Tiny windows, because of the extra pressure exerted by mach 2 speed. Though the Concorde never became cost-effective, before the last flight took place, it had changed aviation forever. Anything after that was anticlimactic, but we did enjoy our tour through the rest of the island. Our guide also told us that Barbados is the place where rum (distilled from sugar cane and molasses) was first concocted in the 1600s. From here, rum spread around the world; but even today, the island is one of the world’s leading processors of it. 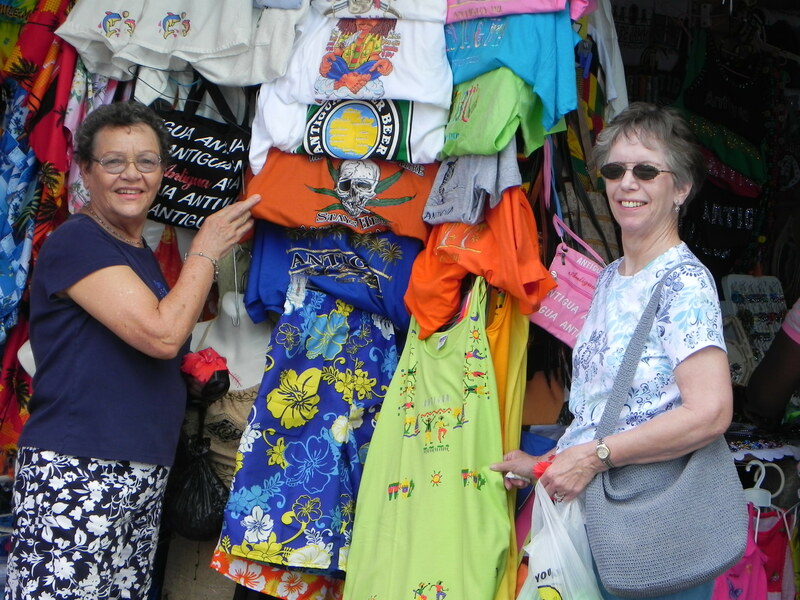 Then it was back to Bridgetown, shopping, and reboarding our ship. Next week, it’s on to Grenada. Well, that flippant Celebrity spokesman couldn’t have been more wrong: no two of these islands could possibly be confused with each other! Each has its distinctive charm, beauty, and uniqueness. Arawak Indians came here over 2500 years ago; the Caribs replaced them around 800 A.D. Apparently, in none of Columbus’s four voyages to the New World did he even come close to St. Lucia. Some say Juan de las Casas discovered it around 1502, but no one is sure. The French settled the island first in 1660. After 150 years of being victorious and being defeated, the British, in 1814 gained ultimate possession, but not until 1842 did English become the official language. Consequently, with most towns French in origin, today’s language and culture is a synthesis of both. The language is a French-based Patois. Another claim to fame St. Lucia has, is that France’s Empress Josephine (Napoleon’s first wife) was born here. How special it was to wake up to the sight of the most mountainous island yet. The tear-shaped—others say “Mango-shaped”—island is 238 square miles of land mass; in size, 27 miles by 14 miles. 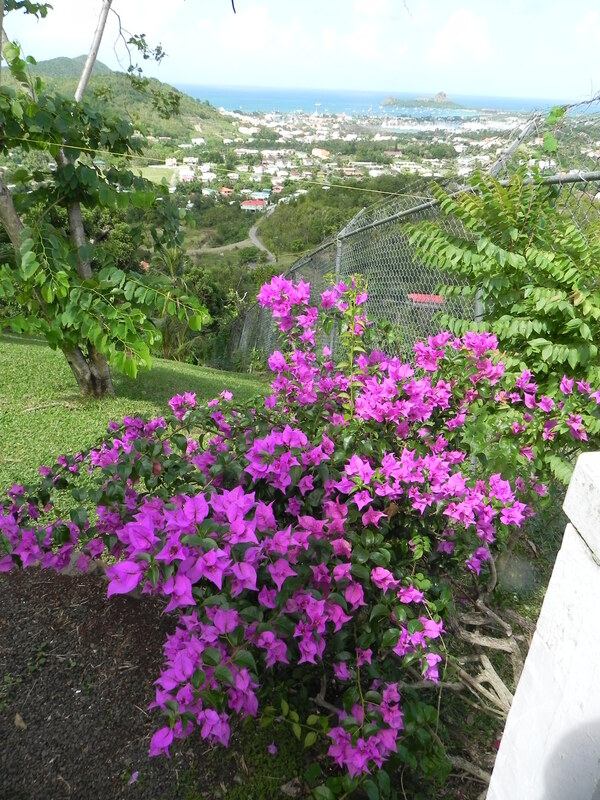 160,000 people (85% of African ancestry) live here; 50,000 in Castries, the capital. Since it changed hands language and culture-wise fourteen times by the British and French, the island has been dubbed “Helen of the West Indies.” And indeed it is beautiful! No small thanks to islanders’ determination to preserve what rain forest they still have (19,000 acres of mountains, valleys, and luxurious greenery), the island receives, depending on locale, 60 to 150 inches of rain a year. Travel writers, when describing the island’s magnificent and dense scenery, exhaust superlatives. No other island we’ve seen can lay claim to two side-by-side iconic half-mile-high volcanic peaks: 2620′ Gros Piton and 2460′ Petit Piton, soaring skyward straight out of the sea, that are known around the world. Its lovely beaches are both of gold sand and black sand. Not surprisingly, it has long been a favorite site for movie producers—such as Dr. Dolittle, starring Rex Harrison; Water, starring Michael Caine; Firepower, starring Sophia Loren, and Superman II. No small thanks to the environmentally concerned islanders, the last remaining species of indigenous parrot in the Eastern Caribbean, the Jacquot, that had been reduced to fewer than a hundred by hunting, was saved just in time from extinction. Today their numbers have swelled to over 400. We have learned that some islands in the Caribbean are today populated by up to 80% who weren’t born there; that state of affairs can’t help but have a major impact on the culture, traditions, achievements, and way of life. Not so on St. Lucia. Case in point: St. Lucia is the only country of its size to have produced two Nobel price winners: Derek Walcott – Nobel Prize for Literature; and William Arthur Lewis – Nobel Prize for Economics. It also fields one of the world’s most successful jazz festivals and one of the most famous carnivals in the West Indies. 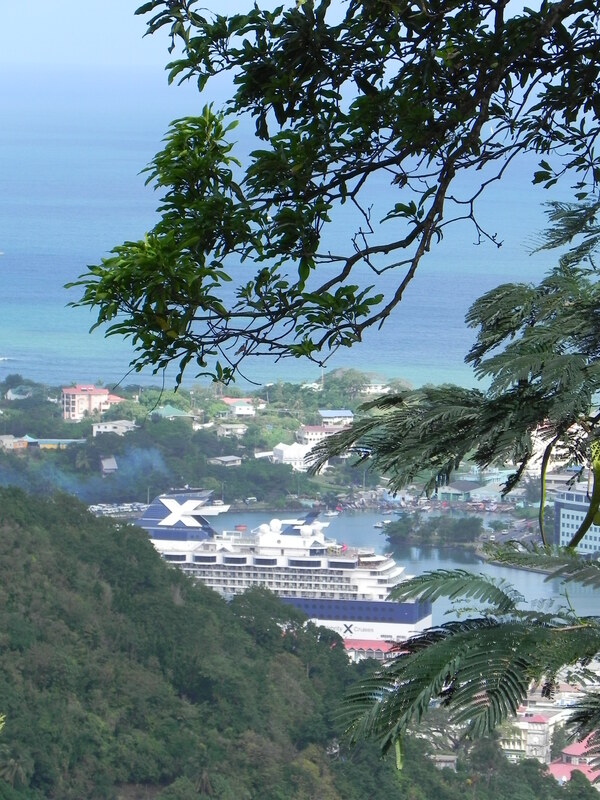 The island is blessed by a number of ports; most cruise ships, however, moor at Castries. Rodney Bay is the island’s leading leisure community. Two international airports provide other tourist entry points. You can always serve as a horrible example. It is to the credit of our guide that she finally managed to calm us down, and by her smiles, humor, and insights into what made St. Lucia into such a romantic paradise (reinforced by the obvious crush she had on our driver), she won over us all. Thanks to her, we learned much about her people. 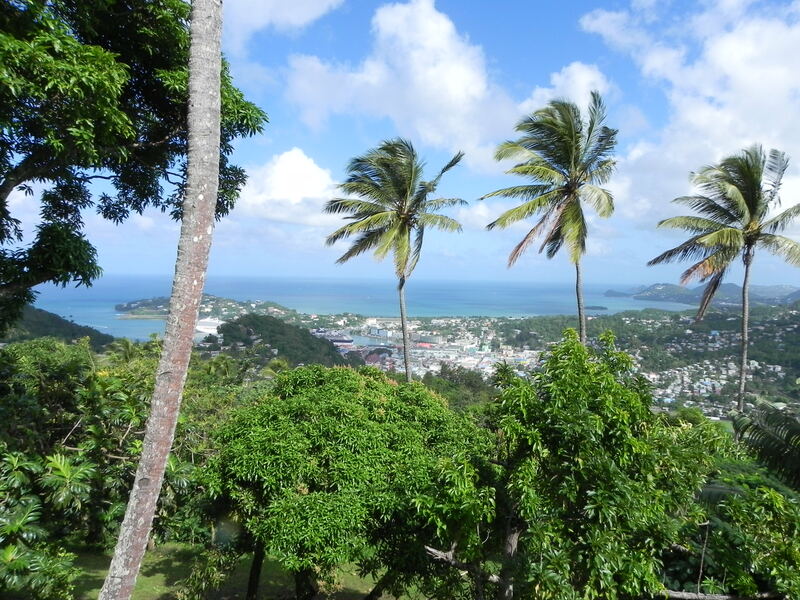 We reveled in the canopied rain forest; all too soon, however, our lecture was over and it was time to shop for curios and post cards in Castries, then board the ship. One of the frustrations travelers face has to do with choices—especially those having to do with day-trips to area sites of interest. The reason being that cruise ships company bean-counters have figured out that they, at best, break even with state room income; they make money in other ways—one of which is day trips. So their itinerary descriptions appear to be directed to making each one look equally attractive. Result: the average cruiser more often than not blindly chooses one, and hopes it will turn out to be the best option. Only later on, after debriefing with cruisemates who chose other itineraries, and reading up on travel literature (especially travel magazines), does s/he find out if the choices were wise or not. In my case, I did not. Not that we failed to learn much from our highland tour—for we did—but later on I discovered that it was unthinkable to have visited St. Lucia yet failed to view the world-famous Pitons. Every time I see them on another calendar, I sigh. Just as I do when I see pictures of the Minoan Palace of Knossos on the island of Crete; instead we opted for the general island tour—and may, as a result, never get back to rectify my omission. But that’s life. Nevertheless, when our ship sailed out of the harbor into another Caribbean sunset, of one thing I was certain: It is not mere coincidence that St. Lucia is called the “Helen of the West Indies.” As was true with Helen of Troy—said to be the most beautiful woman who ever lived”—there was a valid reason why the French and British fought a century and a half to win St. Lucia. Next Wednesday, we’ll move on to Barbados. If you are a history buff, Antigua is the one must-see destination in the Leeward and Windward island chains. It is also the largest in the Leewards: Antigua (13 by 9 miles) covers a land-mass of 108 square miles; Barbuda (11 by 6 ½ miles) covers 62 square miles. 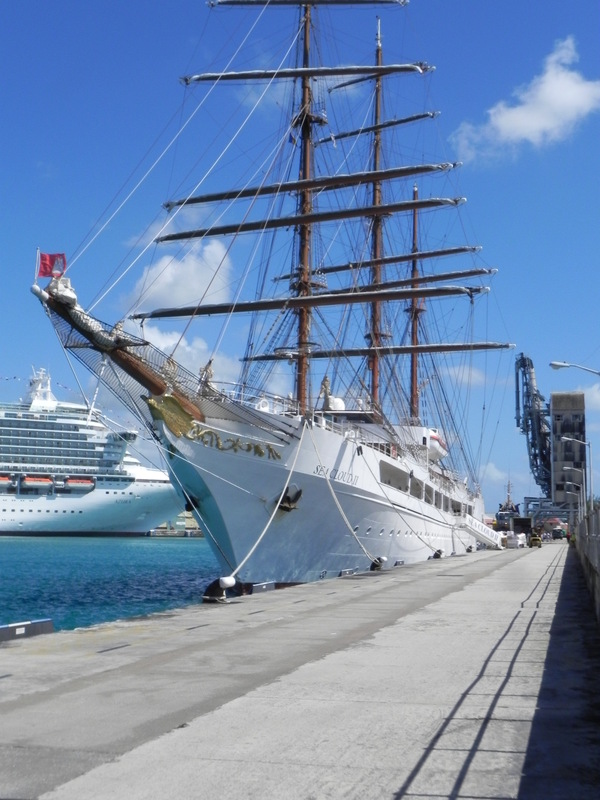 As a basis of comparison, St. Martin and Sint Maarten together total up to only 37 square miles. It was discovered by Columbus in 1493, who named it Antigua, after a church in Seville, Spain. 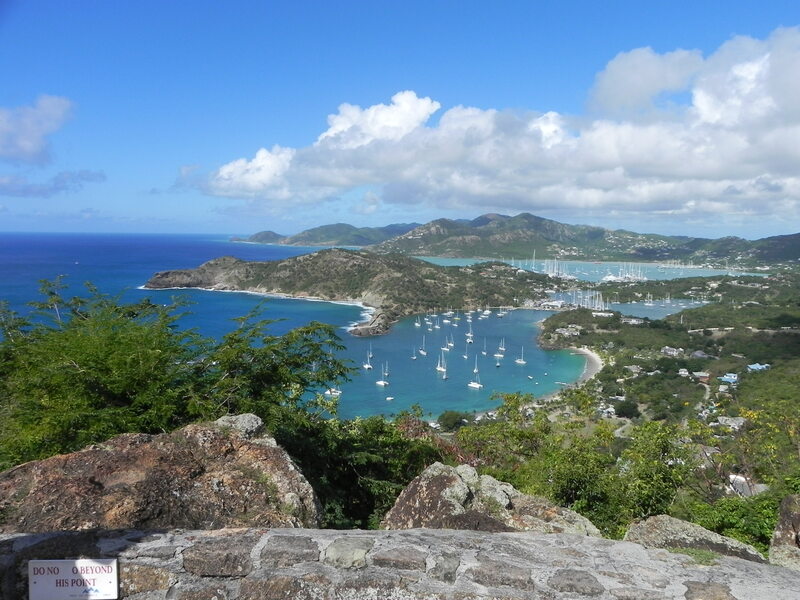 But the Arawak Indians first settled here about 2000 years ago, followed by the Caribs around 1200 A.D. During the 18th and early 19th centuries, Antigua was all but impregnable because of numerous forts and because it was the headquarters for the British fleet. In fact Lord Admiral Horatio Nelson commanded here from 1784 – ‘87. In those days this region was ranked higher in importance to Great Britain than North America, no small thanks to sugar. Like most Caribbean islands of the time, it was populated by African slaves. Because of sugar, Antigua was deforested, consequently today it is covered mainly with scrub brush. Today, most of its 65,000 population lives on Antigua, only 1200 in Barbuda (mainly a wildlife sanctuary), 30 miles away. Because of its 365 beaches, thirty plus hotels, deep-water port for cruise ships, and modern airport, it has become one of the Caribbean’s major tourist destinations. Nelson’s Dockyards (lovingly restored), with its yacht-filled English Harbour, is today the world’s sole remaining Georgian shipyards; it is also the site of one of the world’s top five regattas. Antigua is also one of the best places to spot celebrities such as Eric Clapton, Oprah Winfrey, Denzel Washington, and Morgan Freeman, each of whom own or have owned homes here. Antigua and Barbuda are today an independent nation within the political umbrella of the British Commonwealth. We were the first cruise ship of the day to dock in St. John’s harbor. 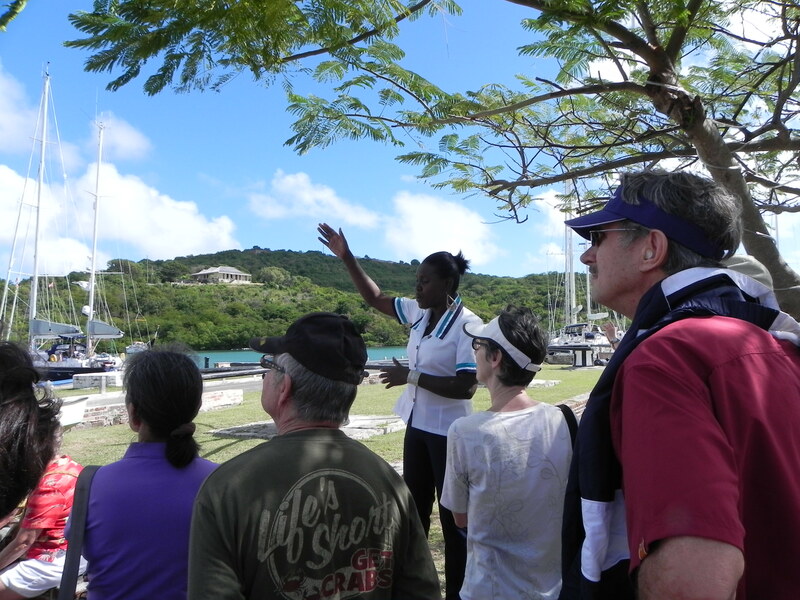 On this tour, Bob Earp, and Ed Riffle joined me for a tour of the island. For us, the piece de resistance had to be Shirley Heights, with its fortified hilltop buildings that once housed the officers’ quarters. The views from here are breathtaking! It was high enough so that there was less risk of dying from malaria. Even more than in the Nelson Dockyard below, it was easy here to close your eyes to slits and imagine the continuous coming and going of redcoated officers in their horse-drawn carriages—the center of attention Lord Nelson himself, destined for immortality in the later Napoleonic wars. It was hard to leave this magical spot and descend to English Harbour and Nelson’s Dockyards. A fascinating place to explore. How we wished we’d had more time to take it all in. For being fully restored (unlike Shirley Heights), it makes it seem like just yesterday that it teemed with an average of a thousand men, and in the harbor were great ships of the line, some with their sails being furled and others with seamen racing up the masts to unfurl them so they could put out to sea. By listening to our guide and reading the tablets and placards we discovered that, for the average seaman, it was anything but romantic: life was brutal and short, no small thanks to malarial mosquitos and dissolution through rum, rum stored in leaden-based casks. Not for these semi-slave seamen the life Lord Nelson; Prince William Henry, Duke of Clarence (later King William IV), who served here under Nelson, and the privileged officers, were able to live. Then it was back to St. John, to purchase post cards, and return to our ship. Always we were conscious of time, for if we were but minutes late, the ship would sail without us—more on that later! Next is the island of St. Lucia.